I hold Woe in ridiculously high regard: their debut is the absolute pinnacle of USBM. Ferocious, blistering tremolos at the forefront of everything with a burning punk edge is what makes great American Black Metal, and Woe helped define the genre as a whole with that explosive introduction. The follow-ups, with a bit of stylistic wandering and occasional clean singing might not have done much to clarify or expand their aggressive, singular sound, but now they’ve returned with a new fiery rage. 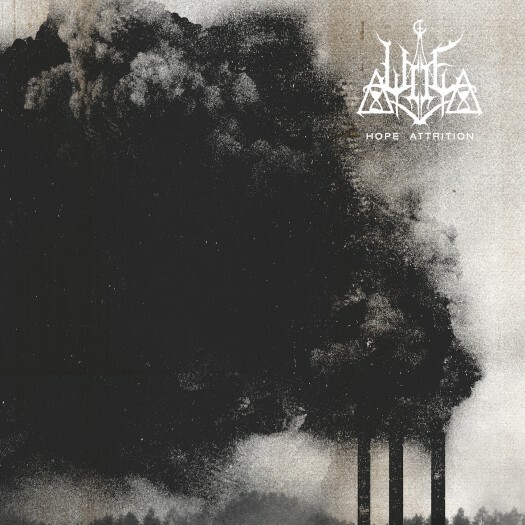 It seems the lineup changes and sonic meandering are now in the past, as Hope Attrition strives to regain the same furor, suffocating anguish, and pure hatred that made the debut a classic and turned the band into a personal favorite. The first few minutes flirt with the senses as the band rebuilds, one brick at a time, and each piece is absolutely gorgeous as it's introduced. The buzzy, razor-sharp guitars give way to the painfully devastating pummeling provided by recent recruit Lev Weinstein—undoubtedly the right-coast’s most devastating skinsman, who’s given one of his beefiest productions to date and adds a glorious heavy base to the band. His little cymbal accents and quick fills are the best in the business. Then, with an introductory shriek of “This is a failure!” it’s clear this is a group reborn with fresh passion and intensity. Chris Grigg, Woe’s visionary, takes a cathartic but demanding approach to everything he touches as he seemingly drains his entire energy with every shout, every riff. My favorite Woe moments have always been those where it’s our main man alone with his guitar, playing his heart out and draining his lungs of everything they contain. A few of those moments are scattered throughout the album and provide some incredible sparks of tension relief. And the whole package is utterly relentless. “A Distant Epitaph” is the only break from the chaos, a sub-minute acoustic meditation that almost feels required. The rest is a whirlwind of swirling riffs, poisonous atmosphere, and punishing rhythms. I’m not sure the band intended for their horrid creation to be enjoyed with a smile, but it’s impossible for such cathartic anger not to provide a little bit of downright fun, although the lyrics like the cover art paint a much bleaker picture. With Woe’s new (ridiculously photogenic) lineup they’ve offered up their most fully realized, cohesive album since their debut and by far their best-sounding, courtesy of Sound Spa’s Stephen DeAcutis. The passion, filth, and pure vitriol that USBM demands is all there, and especially given the state of our world in this moment, Hope Attrition is a required listen.